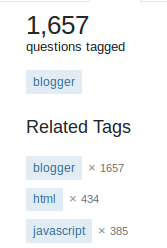 So, when you go to the top-users section of a tag, it will show you some related tags. But it will also show you the tag you're looking at (see image). I fail to see why this would be intended behavior. This has been fixed back in 2018 - thanks for the report! Not the answer you're looking for? Browse other questions tagged bug status-completed tags related-tags .